Malgaigne first described a bony defect of the posterolateral humeral head in 1855 . Later on, in 1940, Hill and Sachs wrote a review article on humeral bony defects after traumatic glenohumeral dislocations, what has given their names to the well-known lesion . It was described as a “line of condensation on the shoulder radiograph when performed in internal rotation” and explained as a compression fracture of the posterior-superior aspect of the humeral head due to an impact against the glenoid rim. Since then, a thorough study of shoulder instability pathophysiology and a better understanding of biomechanics have demonstrated the relevance of this lesion when choosing a treatment option. A correct identification of this injury leads to a well-established decision-making process depending on its size and location and has shown to have a predictive value in recurrence rate. The real incidence of Hill Sachs lesion remains unknown. Hill and Sachs reported in their review an incidence of 20% to 100% . Nowadays, the incidence ranges from 32% to 88% of all anterior shoulder instability events and has been associated to high rates of recurrent instability, where it is present in 77% to 100% of the cases [3-6]. It is also well known that dislocations rather than subluxations cause larger Hill-Sachs lesions, as well as repetitive events [7, 8]. 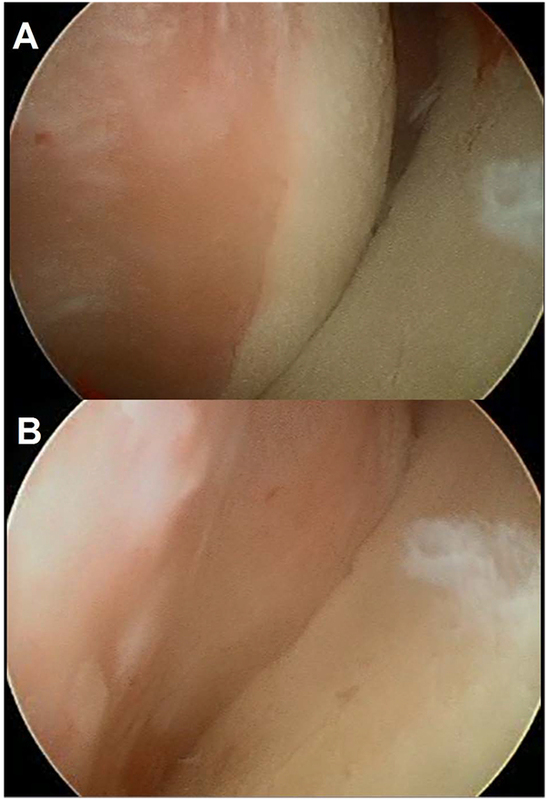 When defining the incidence by direct visualization in arthroscopy, the presence of the “bare area” should be taken into account in order to avoid over-diagnosing. It is the area that lies between the insertion of the posterior capsule and the edge of the articular surface, located along the anatomical neck of the humerus and should not be mistaken for a Hill Sachs lesion. Saito et al. reported that the most inferior portion of the Hill-Sachs lesion could overlap the bare area when it extended more than 19mm from the top of the humeral head . Anterior shoulder dislocation typically occurs with the arm in external rotation and abduction. As the humeral head is forced anteriorly, the capsulolabral structures of the shoulder are stretched and often torn . Then, the head subsequently translates farther anteriorly and inferiorly. In this stage, the postero-superior-lateral aspect of the humeral head impacts against the anterior glenoid rim resulting in a compression fracture . As mentioned before, in order to allow the humeral head to dislocate, an anterior detachment of the capsulolabral tissues is mandatory, what is called a Bankart lesion . In other cases, however, equivalent lesions can be present, as for example, glenoid bony injury (Bony Bankart) or periosteal lesions (anterior labro-ligamentous periosteal sleeve avulsion lesion, ALPSA) [4, 7], that can also contribute to recurrent instability patterns. When any of these happen, in each episode, the soft tissues attenuate progressively, allowing more contact between the soft humeral cancellous bone and the hard glenoid rim cortical bone (Fig. 1). Both mechanisms result in a greater bony defect and a weaker anterior soft tissue restraint, and eventually a higher risk of re-dislocation . Fig. (1). (A)Development of the Hill-Sachs defect: As the humeral heads displaces anteriorly during dislocation (B), the anterior glenoid rim will impact with the soft humeral bone, causing the lesion. In 2000, Burkhart and De Beer  demonstrated that it is not only size that matters, but also location and shape. Sixty years after the first description of a Hill Sachs lesion, a new concept emerged, called the “engaging Hill Sachs”. It was defined arthroscopically as a humeral head defect that is oriented parallel to the anterior rim and thus engages with it when the shoulder is positioned in the dislocation position. The prevalence of this engaging Hill-Sachs lesion was reported to be 1.5% by Burkhart and De Beer , 27% by Pagnani , and 34% by Cho et al. . A few years later, in 2007, Yamamoto et al. introduced the second key concept in order to understand recurrent dislocations, the “glenoid track” . It was described as the contact zone between the glenoid and the humeral head when the arm is elevated in maximum external rotation and maximum horizontal extension and can be expressed in quantitative or qualitative terms. If the Hill-Sachs lesion extends more medially over the medial margin of the glenoid track, there is a risk of engagement and dislocation (Fig. 2). According to the measurement of Yamamoto et al. using cadaveric shoulders, the medial margin of the glenoid track was located at a distance equivalent to 84% of the width of the glenoid. Omori et al. also confirmed this measurement with MRI . These authors also demonstrated that the glenoid track was smaller as the degree of abduction increased, reaching a minimum of 81% of the width of the glenoid when the arm was abducted 150º. In summary, as recently demonstrated by Kurokawa et al. in a CT study, two different types of engaging Hill Sachs can be identified. The first engaging Hill Sachs injury would be a large and wide bone defect and the second type, a narrow but medially located lesion. These authors described an overall incidence of 7% of engaging Hill-Sachs lesions. Interestingly, in all of the cases, a large glenoid bony defect was present. It could be said that when an osseous glenoid lesion increases in size, the glenoid track decreases accordingly, raising the probability of engaging. Fig. (2). Arthroscopic view of an large engaging Hill- Sachs lesion (A) viewed form the posterior portal in a left shoulder. When the humerus is rotated externally the defect slides over the glenoid, “engaging” and causing the dislocation (B). In order to evaluate anterior glenohumeral instability, the following three radiological projections should be obtained: an antero-posterior view of the shoulder in internal and external rotation and an axillary view. As mentioned before, the Hill Sachs defect occurs in the posterolateral aspect of the humeral head and can be better demonstrated by a combination of the internal rotation AP view and the Stryker notch view. On the other hand, Didiee and West Point views allow are especially useful when looking for bony Bankart defects . 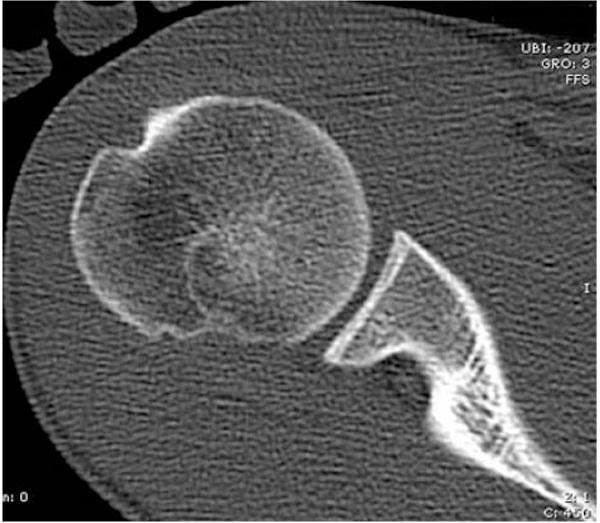 Although MRI continues to be the most used imaging technique (as it is routinely performed in this context to evaluate soft tissue damage), computerized tomography (CT) is widely considered the gold standard for evaluating bone loss Fig. (3). Three-dimensional CT reconstructions allow for a precise evaluation of the size (width and depth on axial and coronal images), orientation (Hill-Sachs angle) and location (bicipital and vertical angles) ; however, it is not useful for detecting purely cartilaginous lesions . Fig. (3). Computed tomography of the shoulder of a patient with shoulder instability showing a small Hill-Sachs lesion. Magnetic resonance (MR) imaging and MR arthrography are the optimal techniques to define soft tissue lesions of the capsule-labral anterior complex. Some authors advocate the use of T1-weighted sequences with fat suppression in axial, oblique sagittal and coronal directions, as well as the ABER (Abduction-External rotation) series . This type of images that are obtained in the prone position for shoulder dislocation, are typically useful in order to detect articular supraspinatus tears and a better identification of the anterior portion of the glenoid labrum and the anterior band of the inferior glenohumeral band . Several classification systems have been proposed, however, none of them has been yet accepted as a useful management tool. For example, Rowe et al. classified the lesion depending on the size as measured in the axillary projection. The Hill Sachs lesion was defined as mild (2cm long x 0.3 cm deep), moderate (2-4 cm long x 0.3-1 cm deep) and severe (>4 cm x > 1cm deep). Calandra et al. and Franceschi et al. based their classification in severity of the injury on direct visualization, whether or not it affected subchondral bone. More recent studies have focused on the volume of humeral head involved or the percentage of the surface of the articular part of the humeral head, either on direct visualization during arthroscopy or measured in MRI or CT images. Given the lack of consensus when classifying Hill Sachs lesions together with the fact that soft tissue damage, demographic features and quality of repair can influence the clinical result of the surgery, the question is now whether or not the injury is of clinical relevance. This idea was first proposed by Flatow and Warner  and was complemented by Di Giacomo et al. recognizing the importance of bipolar bony lesions when applying the glenoid track concept . The average size of the Hill Sachs lesion is 22 mm in width and 5 mm in depth . Saito et al. also studied the location on axial CT images, using a clock face (12 o’clock = anterior, 3 o’clock = medial, 6 o’clock = posterior, 9 o’clock = lateral) and described the top of the lesion located more posteriorly (6:46 hours) and the bottom more laterally (average 8:56) . The critical size of the Hill Sachs lesion that can cause instability is a medium or large defect, greater than 20% of the humeral head articular surface, with a depth greater than 16% of the humeral head diameter, a volume greater than 250mm3 or 1000mm3 or those that affect more than 5/8 of the humeral head radius . On the other hand, Sekiya et al. in a cadaveric study, demonstrated that although a defect of 25% of the humeral head causes an increase in anterior translation and bony contact force, it was not enough in isolation to cause recurrent anterior instability . A correct assessment and treatment of the bony lesions associated to soft tissue damage in anterior shoulder instability is crucial. The recurrence rate after arthroscopic labral repair in the absence of glenoid or humeral head loss is only 4%  but it rises to 67% when substantial glenoid or humeral bone loss is present . It has also been reported that the presence of a Hill-Sachs that could be noticed in a simple Rx with the shoulder in external rotation multiplied the recurrence rate by three (from 10% to 31%) . Traditionally, the different treatment options considered when dealing with a large Hill-Sachs defect were focused in addressing the humeral defect itself (by filling it with bone or tendon or tendon or putting it away with an osteotomy); However, the concept of glenoid track changed the focus to an association of both humeral and glenoid defects. Some authors have advocated that a procedure more focused in the glenoid side that increases the glenoid track, such as a coracoid transfer to the anterior glenoid would be able to reduce the risk of an engaging Hill-Sachs . Nevertheless, the most accepted absolute indications for an specific surgical management of Hill Sachs lesions are: Displaced humeral head fracture-dislocation and an associated Hill Sachs injury or lesions that affect more than 30%-40% of the humeral head with chronic dislocation or recurrent anterior instability. Relative indications would include: lesions of 20% to 35% of the humeral head with glenoid engagement on examination, lesions of more than 20% of the articular surface and signs of humeral head engagement on examination and lesions of 10% to 25% of the humeral head in the cases when the humeral head does not remain well centered in the glenoid fossa after arthroscopic instability repair . A non-surgical approach might be considered in the cases of small osseous defects and non-engaging Hill-Sachs lesions. An appropriate treatment of Bankart lesion and other relevant pathology should be carefully addressed. In these cases, the standard rehabilitation protocol is performed afterwards, with an especial focus in deltoid muscle, rotator cuff muscles and scapular stabilizers strengthening . This technique consists in transforming an intra-articular humeral defect in an extra-articular lesion, thus reducing the risk of engaging (Fig. 4). Remplissage is the French word for “fill-in” and it is used in this context as the technique consists in a posterior capsulodesis and infraspinatus tenodesis into the bony defect area. It was first described by Purchase et al. in 2008 and posteriorly modified by Koo et al. in 2009 and is indicated in moderate to great humeral head bony defects without glenoid bone loss or combined with a non significant glenoid bone loss. The arthroscopic technique starts with a posterior vision in order to identify the Hill Sachs lesion, once the standard general evaluation of the joint has been performed . An accessory portal is made just lateral to the posterior portal aiming the area of the lesion. After carefully debriding the Hill Sachs zone an implant with two strands is introduced in the cancellous bone, and the two strands are passed independently through the infraspinatus muscle. It can also be performed with two or more implants to create a greater footprint. More recently, the use of all-suture implants has also been advocated. Care should be taken not to place the anchors too medial as it can result in restricted motion . Knots are usually tied in the subacromial space after the anterior capsulolabral repair. Fig. (4). The Remplissage procedure: the lesion is identified from the anterosuperior portal (A). After debridement of the surface (B), two implants are placed along the defect (C) and the corresponding sutures passed percutaneously through the posterior capsule and infraspinatus tendon (D) allowing for an effective capsulotenodesis. The postoperative management is not different from a simple anterior capsulolabral repair and will consist in 3 weeks of sling followed by passive and active exercises limiting external rotation to 0º until the sixth week. Several authors have demonstrated healing of the capsulotenodesis by means of imaging techniques [33, 34]. Remplissage is an effective procedure and has demonstrated that reduces the rate of re-dislocation from >25% to approximately 5% when a Hill Sachs of 25% of the humeral head is present [29, 34-36]. Wolf et al. reported excellent results in their series of 45 patients with medium size humeral defects even in the presence of small glenoid defects. The mean follow up was 4 years and the reported re-dislocation rate of only 4.5% with a minimal rate of complications . Park et al. in a longer follow up series found a recurrence rate of 15% after 5 years . However, most of these studies lack of a control group. Ruiz Ibán et al. in a paired cohort study compared a group of similar patients with large Hill-Sachs defects that underwent simple Bankart repair with a group of patients in which both procedures were performed. They also reported a decrease in dislocation rate of 17% without finding any differences in range of motion or functional outcome . With regards to clinical outcome, Boileau et al. in their series reported a rate to return to sports of 90%, achieving the same level in 68% of the cases, including overhead activities. The rate of stable shoulders after 2 years of follow up was 98% . Park et al. found lower WOSI scores at final follow up in the cases when a concomitant lesion (ALPSA; Kim lesion) was present and subsequently addressed during surgery . The complication rate of this procedure is very low (0.9%). Persistent tenosynovitis of the long head of biceps and ipsilateral ulnar nerve palsy have been described . Despite the safety of this technique, it has been related to stiffness of the joint and limited range of motion due to its non-anatomic nature. Boileau et al. reported a loss of external rotation of approximately 10º in their series . However, when comparing final range of movement after undergoing simple Bankart repair and Bankart repair with an associated remplissage technique, a similar loss of external rotation can be expected in both groups . This finding could suggest that the loss of external rotation might not be attributed only to this technique. Moreover, Merolla et al. have reported that infraspinatus muscle strength is recovered satisfactory when comparing to healthy subjects . Glenoid bone augmentation is a well-documented technique for addressing recurrent instability in the presence of an anterior glenoid defect [13, 41]. The most common procedures include coracoid transfer and iliac bone grafting. However, as previously mentioned some authors also advocate the use of these procedures in the presence of a Hill Sachs lesion in order to increase the glenoid track and reduce the risk of engagement (Fig. 5) [29, 42, 43]. Fig. (5). Biomechanical rationale for anterior glenoid bone augmentation: in a patient with a significant humeral bony defect (A) supplementation of the anterior glenoid rim will avoid engaging of the Hill-Sachs lesion (B). The aim of this technique is to restore the anatomy of the humeral head by filling the defect created by the impaction of the glenoid . This would eventually avoid engaging of the lesion. The main indications are a humeral defect of more than 40% of the humeral head in the absence of glenoid bone loss or a failed Bankart repair in the presence of a humeral defect greater than 25% [36, 45]. Bone plugs are custom-made for each defect using an autograft, an allograft Fig. (6) or a synthetic material [45-48]. In exceptional occasions a fresh humeral osteoarticular graft can be used to replace the entire humeral head. The potential advantages of this procedure are the anatomical nature of the reconstruction, the restoration of range of movement and the avoidance of a replacement in extreme cases. The downsides are the necessity of an open approach, the risks of osteonecrosis of the humeral, graft resorption, nonunion or hardware complications . Only case series and case reports have been published . The complication rate is as high as 20% to 30% with a reoperation rate of more than 25% of the patients. Fig. (6). 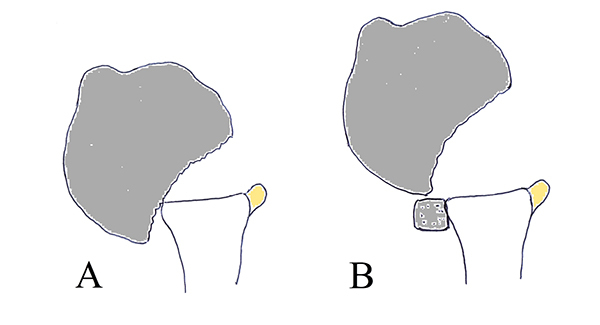 Humeral head augmentation: An osteochondral allograft is placed in the humeral defect and fixed with 2 headless compression screws (A,B). The CT scan shows adequate integration of the defect and restoration of the concavity (C). Desimpaction of the humeral head is relative new techniques that consist in elevating the compressed bone and support it with bone graft in an attempt to restore native anatomy [50-52]. The main indication would be an acute lesion of less than 3 weeks of evolution and less than 40% of involvement of the articular surface . It can be performed using a cortical window in the mid greater tuberosity just lateral to the bicipital groove and introducing a curved bone tamps in a retrograde fashion until reaching the defect. The correction should be performed and evaluated under fluoroscopic guidance . Alternatively, Re et al. described a percutaneous technique helped by an anterior cruciate ligament tibial guide . More recently, the use of an inflatable balloon has also been described . However, only cadaveric studies have been reported and consequently more clinical studies should be performed before recommending these techniques. Humeral osteotomy was first described by Weber and consists in a rotational osteotomy of the proximal humeral shaft in order to improve retroversion of the proximal humerus . It involves a subcapital humeral osteotomy with a medial rotation of the humeral head and imbrication of the subscapularis and anterior capsule . The main retroversion aimed is 20º to 35º and the use of a guide intraoperatively is recommended to confirm the amount of derotation before plating, as it is a technically highly demanding procedure [55, 56]. Kronberg et al. studied the influence of diminished humeral retroversion in recurrence rate after Bankart repair . The reported recurrence rate is of 5% to 10%, however, the overall rate of complications and reoperation is high . Complications would include pain (complex regional syndrome), hematoma, infection, delayed malunion, rotation deficit and necessity of hardware removal [36, 53, 56]. Weber et al. reported the greatest series of rotational osteotomies, consisting of 180 cases. The recurrence rate that they found was 6.8% without detecting a significant loss of external or internal rotation. Excluding hardware removal, only 9 patients required re-operation for a major complication. However, more recent series have been unable to reproduce their results. Brooks-Hill et al. in their series of 25 patients reported that the mean ASES score was 78 points, but 10 of them were unable to wash their backs with the affected arm. Moreover, nine of the 25 patients required a re-intervention . Humeral arthroplasty could be indicated in patients with humeral defects greater than 45% of the humeral head. In elderly patients, the existence of osteoporotic bone leads to greater bony defects. Moreover, it is frequent to find a rotator cuff disease and degenerative changes what can be an indication for a hemiarthroplasty, total arthroplasty or even reverse arthroplasty. In the clinical scenario of a young patient with a massive Hill Sachs and early degenerative changes, there are not satisfactory options. More conservative options would include partial and complete resurfacing . When comparing partial resurfacing with graft implantation, it is not clear whether it is easier to match the defect with the implant or with the bone plug, as the geometry might be difficult to reproduce [57, 58]. With regards to complete resurfacing and arthroplasty, it might be indicated in the setting of chronic dislocations with Hill Sachs defects greater than 40% [36, 54]. In the context of anterior shoulder instability, humeral defects (Hill-Sachs lesions) have a clear impact in the recurrence rate of the dislocated shoulder and in the success of its surgical management. It is essential to assess the humeral defects appropriately; this can be done with simple radiographic evaluation or MRI, but CT with 3D reconstruction is considered the best diagnostic procedure. During evaluation, attention should be paid not only to the width, length and depth of the defect but also to its position and orientation, trying to define if the defect can easily converge with the anterior rim of the glenoid during abduction and external rotation (an engaging Hill-Sachs). This can happen even with smaller defects when an associated glenoid defect is present, thus the glenoid track has to be carefully assessed. Larger lesions and engaging lesions should be addressed specifically during surgery. Many alternatives have been proposed such as allo or autograft reconstruction, desimpaction of the compressed bone, humeral osteotomies and even arthroplasty but there are only significant reports of efficacy with the remplissage technique. This procedure, a posterior capsule-tenodesis of the infraspinatus over the defect has shown to lower the recurrence rate of patients with larger defects to levels similar to patients without relevant defects and has a low complication rate. Malgaigne JF. Traité des fractures et des luxations. Paris: JB Balliêre 1855. The grooved defect of the humeral head: A frequently unrecognized complication of dislocations of the shoulder joint. Radiology 1940; (35): 690-700. Kim DS, Yoon YS, Yi CH. Prevalence comparison of accompanying lesions between primary and recurrent anterior dislocation in the shoulder. Am J Sports Med 2010; 38(10): 2071-6. Ozaki R, Nakagawa S, Mizuno N, Mae T, Yoneda M. Hill-sachs lesions in shoulders with traumatic anterior instability: evaluation using computed tomography with 3-dimensional reconstruction. Am J Sports Med 2014; 42(11): 2597-605. Saito H, Itoi E, Minagawa H, Yamamoto N, Tuoheti Y, Seki N. Location of the Hill-Sachs lesion in shoulders with recurrent anterior dislocation. Arch Orthop Trauma Surg 2009; 129(10): 1327-34. Speer KP. Anatomy and pathomechanics of shoulder instability. Clin Sports Med 1995; 14(4): 751-60. Protzman RR. Anterior instability of the shoulder. J Bone Joint Surg Am 1980; 62(6): 909-18. Provencher MT, Frank RM, Leclere LE, et al. The Hill-Sachs lesion: diagnosis, classification, and management. J Am Acad Orthop Surg 2012; 20(4): 242-52. Omori Y, Yamamoto N, Koishi H, et al. Measurement of the glenoid track in vivo as investigated by 3-dimensional motion analysis using open MRI. Am J Sports Med 2014; 42(6): 1290-5. Kurokawa D, Yamamoto N, Nagamoto H, et al. The prevalence of a large Hill-Sachs lesion that needs to be treated. J Shoulder Elbow Surg 2013; 22(9): 1285-9. Pavlov H, Warren RF, Weiss CB Jr, Dines DM. The roentgenographic evaluation of anterior shoulder instability. Clin Orthop Relat Res 1985; (194): 153-8. Van der Woude HJ, Vanhoenacker FM. MR arthrography in glenohumeral instability. JBR-BTR 2007; 90(5): 377-83. Aydıngöz U, Maraş Özdemir Z, Ergen FB. Demystifying ABER (ABduction and External Rotation) sequence in shoulder MR arthrography. Diagn Interv Radiol 2014; 20(6): 507-10. Franceschi F, Longo UG, Ruzzini L, Rizzello G, Maffulli N, Denaro V. Arthroscopic salvage of failed arthroscopic Bankart repair: A prospective study with a minimum follow-up of 4 years. Am J Sports Med 2008; 36(7): 1330-6. Flatow EL, Warner JI. Instability of the shoulder: complex problems and failed repairs: Part I. Relevant biomechanics, multidirectional instability, and severe glenoid loss. Instr Course Lect 1998; 47: 97-112. Di Giacomo G, Itoi E, Burkhart SS. Evolving concept of bipolar bone loss and the Hill-Sachs lesion: from “engaging/non-engaging” lesion to “on-track/off-track” lesion. Arthroscopy 2014; 30(1): 90-8. Kaar SG, Fening SD, Jones MH, Colbrunn RW, Miniaci A. Effect of humeral head defect size on glenohumeral stability: A cadaveric study of simulated Hill-Sachs defects. Am J Sports Med 2010; 38(3): 594-9. Cho NS, Yoo JH, Rhee YG. Management of an engaging hill-sachs lesion: Arthroscopic remplissage with bankart repair versus latarjet procedure. Knee Surg Sports Traumatol Arthrosc 2015. Elkinson I, Giles JW, Boons HW, et al. The shoulder remplissage procedure for Hill-Sachs defects: Does technique matter? J Shoulder Elbow Surg 2013; 22(6): 835-41. Park MJ, Tjoumakaris FP, Garcia G, Patel A, Kelly JD IV. Arthroscopic remplissage with Bankart repair for the treatment of glenohumeral instability with Hill-Sachs defects. Arthroscopy 2011; 27(9): 1187-94. Ruiz Ibán MA. Técnica de remplissage para defectos humerales grandes. Un estudio a medio plazo de cohortes emparejadas. Revista Española De Cirugía Artroscópica 2015; 21(2): 85-9. 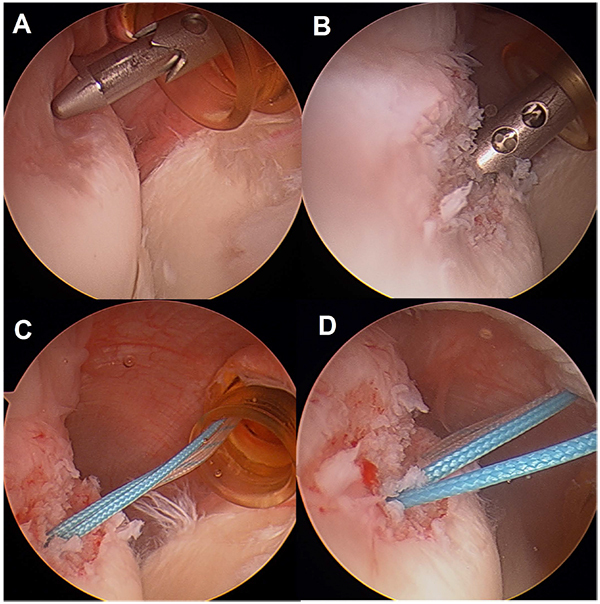 Merolla G, Paladini P, Di Napoli G, Campi F, Porcellini G. Outcomes of arthroscopic Hill-Sachs remplissage and anterior Bankart repair: a retrospective controlled study including ultrasound evaluation of posterior capsulotenodesis and infraspinatus strength assessment. Am J Sports Med 2015; 43(2): 407-14. Burkhart SS, De Beer JF, Barth JR, et al. Results of modified Latarjet reconstruction in patients with anteroinferior instability and significant bone loss. Arthroscopy 2007; 23(10): 1033-41. Degen RM, Giles JW, Johnson JA, Athwal GS. Remplissage versus latarjet for engaging Hill-Sachs defects without substantial glenoid bone loss: a biomechanical comparison. Clin Orthop Relat Res 2014; 472(8): 2363-71. Saltzman BM, Riboh JC, Cole BJ, Yanke AB. Humeral head reconstruction with osteochondral allograft transplantation. Arthroscopy 2015; 31(9): 1827-34. Armitage MS, Faber KJ, Drosdowech DS, Litchfield RB, Athwal GS. 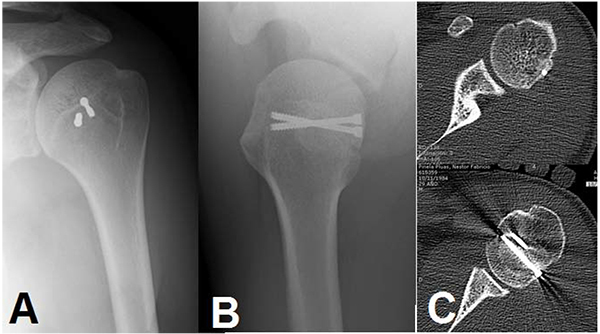 Humeral head bone defects: Remplissage, allograft, and arthroplasty. Orthop Clin North Am 2010; 41(3): 417-25. Brooks-Hill AL, Forster BB, van Wyngaarden C, Hawkins R, Regan WD. Weber osteotomy for large Hill-Sachs Defects: clinical and CT assessments. Clin Orthop Relat Res 2013; 471(8): 2548-55. Kronberg M, Broström LA. Rotation osteotomy of the proximal humerus to stabilise the shoulder. Five years’ experience. J Bone Joint Surg Br 1995; 77(6): 924-7. Moros C, Ahmad CS. Partial humeral head resurfacing and Latarjet coracoid transfer for treatment of recurrent anterior glenohumeral instability. Orthopedics 2009; 32(8): orthosupersite.com/view.asp?rID=41928.